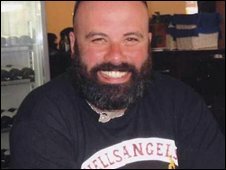 Seven members of a motorcycle gang convicted of murdering a Hells Angel on the M40 have been jailed for life. Their victim, 35-year-old mechanic Gerry Tobin, was shot in a "ruthlessly planned ambush" in August last year. He was returning from the Bulldog Bash biker festival to London when he was shot by members of a rival gang. The judge at Birmingham Crown Court told the men they would each serve minimum terms of between 25 and 30 years for the "appalling murder". Mr Justice Treacy told the defendants, who are all members of The Outlaws biker gang: "A totally innocent man was executed with a firearm in broad daylight on a busy motorway for no reason other than that he belonged to a different motorcycle club than yours." The court heard although Sean Creighton and Simon Turner fired the shots from a Rover car, the other defendants played a part in the "cold-blooded, premeditated, almost military plan". Creighton, 44, from Coventry, described as president of the south Warwickshire Outlaws, will serve a minimum of 28 years and six months after pleading guilty to murder and firearms offences. Simon Turner, 41, from Nuneaton, was said to be the gang's sergeant-at-arms, and was given a minimum term of 30 years for murder and possessing a firearm with intent to endanger life. Malcolm Bull, 53, of Milton Keynes, will serve 25 years and Dean Taylor, 47, of Coventry, will serve 30 years. Both were convicted of murder and a firearms offence in the seven-week trial. Karl Garside, 45, Dane Garside, 42, and Ian Cameron, 46, all of Coventry, were also found guilty of murdering Mr Tobin. Karl Garside was given a minimum term of 26 years, Dane Garside 27 years, and Cameron was told he must serve at least 25 years in jail. Mr Tobin was described in court as a "fully-patched", or fully-initiated, member of the Hells Angels. He had been riding back from the festival near Long Marston, Warwickshire, to his home in Mottingham, south-east London, when he was hit by a bullet which lodged in his skull. Mr Justice Treacy added: "Gerry Tobin was a decent man of good character. He was a total stranger to you. "The utter pointlessness of what you did makes his murder more shocking." The gang were all handcuffed in the dock after the judge said police had received intelligence that Creighton planned to attack Bull, believing he had given information to detectives. Outside the court there were about 100 members of The Outlaws and dozens of armed police while the sentencing hearing took place. In sentencing the seven men, the judge also spoke of the effect Mr Tobin's murder had on those closest to him. He said Mr Tobin's parents had found it difficult to come to terms with the fact their only son had been "cold-bloodedly executed". And he said the life of Mr Tobin's fiancee Rebecca Smith, 26, had been "utterly changed". "She had hoped to marry him, have a family life with him, to have children with him," he said. The judge added: "None of you has showed the remotest feeling, consideration or remorse for what you did." The court heard that several of the gang had previous convictions. Turner was sentenced to 10 years in prison in 1993 for throwing petrol over a stranger and stabbing him to settle a debt. Dane Garside had been involved in an axe attack in 1990 and various assaults while his brother Karl had convictions including battery, taking a knuckleduster to court and grievous bodily harm. Taylor was charged with aggravated burglary after being involved in a biker-related incident in 1984. 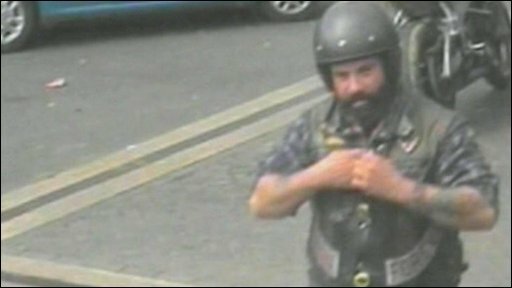 He and seven other men had travelled to Leicester with three sawn-off shotguns over a dispute with the Hells Angels.